I don’t usually write in depth about seminars and events but I recently attended two seminars that are worth promoting as they were done for two very worthwhile causes. So it made sense to do a mini write up highlighting how awesome the seminars were but also highlight the charities that they supported! Sunday 27th August was the first day after the IBJJF World Masters when I could justifiably be nursing a hangover in Vegas but instead, I headed to Sergio Penha’s Academy for a very worthy Grapplethon in aid of Tap Cancer Out. which as the name implies uses BJJ to raise funds for a range of cancer charities. I won’t write too much about the academy as a seminar doesn’t give you a full experience or picture. However, everyone I met from the academy was really friendly so although I can’t discuss the classes or the Academy as a whole I have a feeling that they would have a pretty friendly vibe! For the seminar section, we were treated to a black belt technical battle. 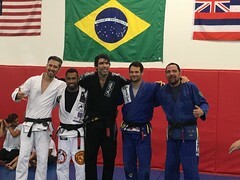 Several awesome black belts including Eliot Kelly, Abraham Marte and Alan “Gumby” Marques plus more who all showed off their favorites techniques as well as going head to head to in jiu jitsu battle to better each other’s moves. Technically the seminar had something for everyone. It was also highly entertaining with lots of banter and “mike drops”. Fortunately, Open Mat Radio and Verbal Tap Podcast will hopefully be releasing the videos at some point in the near future. I was really gutted that I had to skip most of the rolling element of the session due to driving back to Los Angeles but I’d definitely recommend anyone to make a future event. The event was organised by Paul Moran from Open Mat Radio and you can read about his story and why he supports the charity here. You can also still support the seminar via this web link. 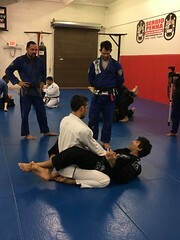 My second charity seminar was last weekend and much closer to home at my own gym Factory BJJ. This is the gym’s third annual seminar supporting Black Belt Gary Furlong and his work for Action for Children. Action for Children is a charity that does a range work with young people but Gary’s fundraising is directly linked to their work to reduce youth homelessness in the UK through a variety of projects and interventions. The day was a passing master class with black belts Adam Adshead, James Nardone and of course, Gary himself showing a range of passing options including leg drags sets ups, dealing with shin shields and bettering those tricky butterfly hooks. Mixed in with some friendly rolling and raffle where most of the prizes are nearly always won by people purchasing tickets online rather than in the room! Foto Rolls Photography also kindly supported the day by taking photographs (including some featured on this blog so do check out his work!). Garry is sleeping out on the 3rd October this year come sleet, snow or shine in support of Action for Children and you can continue to show your support and find out more via his just giving page.